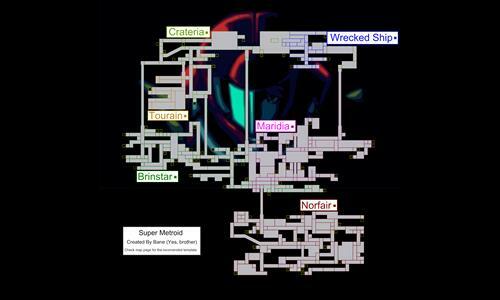 The map from the 1994 Super Nintendo Entertainment System game, Super Metroid. There are no cross-vertice connections. All non-area bonuses represent items within the game. The template below is recomended. Review by Nathan on 11/2/2014. I like it. I was afraid it would be too linear, but the doubled corridors and no diagonal connections save this map from that fate. And you just can't beat the map for nostalgia. That being said, the distribution points may need to be revisited. He can grab control of Norfair can faceroll the rest of the way. I did see two connections errors. First, Wrecked Ship 10 should connect to the save room. Second Norfair 16 should not connect to Norfair 19.
thanks for pointing those out, and thanks for the review. Review by otinanaimail on 11/2/2014. Review by A_B3 on 1/14/2018.